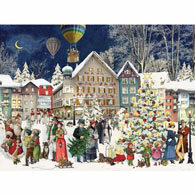 Holiday House is a 500 piece jigsaw puzzle designed by artist Barbara Behr. 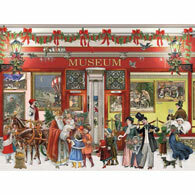 A four story Victorian building is decorated with lights, garlands, ribbons and bows for the holidays. Angels fill the sky as children and families stroll and play on the street below. Available in two piece counts.